No Extra Charge for Solid Strength as Standard. In Sweden Nordic timber has been their secret for many years and has been used extensively throughout their country. The slow-growing nature of this timber makes it ideal for the garden as it is both stable and strong. And this is why the Epsom multi room combi log cabin with porch and its three rooms utilises it throughout to ensure the longest life for the building. Add in the great design with its contemporary and modern styling and you can appreciate why this should be the building for your garden. Sharing with your family will be a joy. This ‘Epsom’ combination log cabin is built using the right materials, such as solid Nordic timber, as well as being made in the correct way. However, you will find that some log cabin manufacturers take a different view and make ‘down to a price’. This is NEVER a good long term view as these cheap materials will tend to let you down sooner than expected. So using cheap materials such as chipboard, OSB or other sheet materials may save a little money – in the long run, won’t be good. A quality log cabin should reflect the high-grade materials used from the Nordic timber and through to double glazed doors and windows. Timber should only come from sustainable sources as well as being properly kiln dried. Little things can make for a superb building. This multi-room Epsom combination log cabin with its three rooms can be built by a competent DIY’er but is a little more involved than a ‘run of the mill’ standard cabin. And it’s recommended that you use installers used to building these cabins. We have third party contacts for installers who can build this building for you. This will enable you to have peace of mind that it will be assembled correctly. Whilst it does add to the cost you can just spend your time thinking of ways to enjoy your new building. However, if you want a challenge it’s there for you. There are many websites selling garden cabins and they all tend to look good but how do you know what they will really be like? There is only one way and that is to actually go along and see examples ‘in the flesh’ so to speak. At our display site in Surrey, not far from Guildford and Farnham, you can many examples of the Trentan range. You are able to go inside, jump on the floor, push the sides and examine the general build quality. By doing this you will know what you will be getting. The peace of mind by doing so is priceless so don’t take a risk on a flashy web site or glossy brochure, always deal with a company which allows you to see their products. You won’t regret it! 1st Choice Leisure Buildings is a family businesswhich started in 1979 BT (before Thatcher) understands the requirement to make log cabins to a standard and not DOWN to a price. Our Ethos is to ensure quality reigns over cheapness and to date, this has been the right policy. Size: The Epsom ‘1’ multi-room log cabin is 5.24m x 3.9m plus 1.2m balcony (20¼ft x 13ft nominal overall size). Pent, sloping roof style.Note this is the external size of the body of the cabin. The lugs extend 100mm on each corner making the overall size (as most other companies quote) 200m larger. We mention this so you know you are comparing ‘eggs with eggs’. Approximate clear internal size will be approx 100mm less. Please check with us if internal size is crucial. Floors: The log cabin floors are 28mm thick T&G untreated boards. No chipboard, OSB or other cheap sheet materials used on the floor, unlike some other log cabin UK suppliers. The sturdy 70x45mm floor joists are normally spaced no more than 650mm apart. All floor joists are pressure treated for long life as standard. Roofs: 18mm thick T&G boards used on the roof sections supported by strong roof beams. Roof beams meet EN 388 stringent standards. Untreated. Roofing felt included as standard with option for EPDM felting system. 300mm (approx 12in) overhang on sides and rear. On the front there is 120cm (47in) roof overhang. 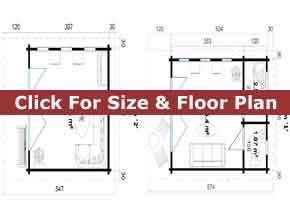 Partition: Two internal partitions included as standard giving you three distinct areas within this multi room log cabin combo building. Two single doors included for access. Untreated. Kiln dried timber from sustainable sources. Extra Doors: On the Epsom ‘1’ log cabin are included two Joinery quality single door 835mm wide x 1933mm high (32¾in x 76in) – approx sizes. Easy adjust hinges complete with gasket seals, recessed door latches, highly secure Euro Cylinder barrel Type mortice lock, fitted gold finish door handles and three unique keys. Supplied untreated. Beware of doors with single glazing and no multi-point locking system. This enables easy access into the two small rooms. Windows: Contemporary style joinery quality inward opening windows. Included as standard are three windows which are 552mm wide x 1729 high (21½in x 68in) AND on the Epsom ‘1’ one window 510mm x 510mm (20in x 20in) AND one window 1500mm x 510mm (59in x 20in). Supplied untreated as standard. Double glazed as standard NOT single glazed. 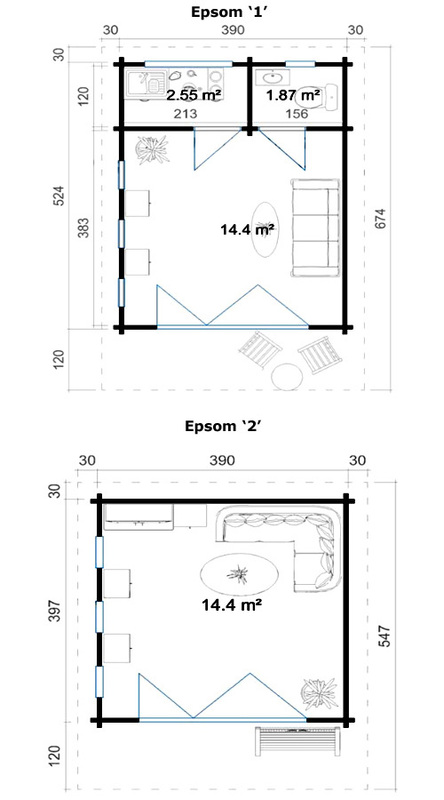 Lower Walls: Height: 238cm (93½in) – on these Epsom Combi log cabins. Ridge Height: Height is 251cm – on all Epsom multi room log cabins. Installation: Supplied in kit form for self erection. Option for assembly through a third party if required. If being built you would require a concrete base or solid and level paving slab base. Optionally, we have an option for building a base for you in some areas. These log cabins are assembled by interlocking the panels for ease of taking it down again if you decide to move. Delivery: All buildings are delivered and HIABed off the lorry for you free of charge throughout central & Southern England. Deliveries to Scotland would cost £150 extra. Deliveries to Cornwall & Devon, South & West Wales and Northern England would cost an extra £60. When buying a log cabin the best advice is to visit a display site so you can examples for yourself. Only by doing this can you be sure you are not buying a ‘dud’. We will be delighted to see you at our display site in Surrey where you can see many examples of cabins.